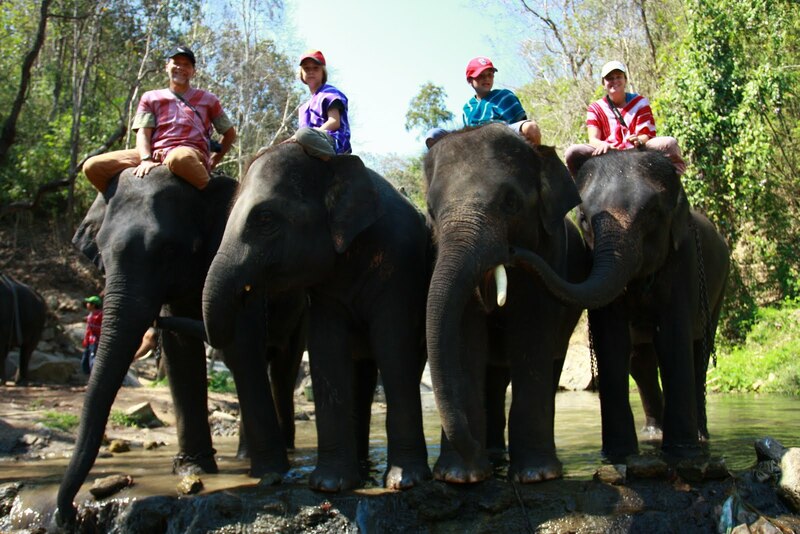 Huyghe Adventures Abroad: Gibbons, Tigers and Elephants! March is a great month in Hong Kong: the weather is warming up, humidity is low. Flowers are blooming, birds are nesting, it is really very beautiful, spring is in the air. My favorite season and a great time for hiking, something we all try to do as much as possible here. This month we went on a few hikes with neighbors Colleen and mom Jamie who introduced us to GeoCaching, just a very fun way to involve the kids and get them excited to walk (www.geocaching.com), and a fantastic opportunity to discover some new places in HK. The Dragon's Back hike took us all the way to Shek O for lunch at a great Thai restaurant, while the Violet Hill hike took us right behind our building in the mountains overlooking Repulse Bay. I continue to hike with both my french group and english group, we went on several hikes in the New Territories on the MacLehose Trail and another on Lamma Island to Mount Stemhouse where the descent was so steep, I lost 3 toe nails! Not so great for summer pedicures but lots of fun nevertheless! This month was also Spring Break at school so in true Huyghe fashion, we decided to go to Thailand for a week. The kids and I first left on Saturday while Steve went on a 5 hour hike/run(!) around Tai Tam Country Park. The kids and I stayed for 4 days in Phuket at Mom's Tri Boathouse on Kata Beach. A great place to relax, right on the beach with a very nice pool, great food, beautiful surroundings. We went on a island hopping tour of Bamboo Island, Phi Phi islands, Koh Yao and Coral islands and saw the most gorgeous beaches and most incredible marine life ever. The water was so clear and warm, snorkeling was a real treat. On Wednesday we flew to Chiang Mai in the north to be met by Steve for the rest of the week/weekend. There we went on a "Flight of the Gibbons" adventure of 20km of zip lines and apseiling through the jungle! It was followed by a nice traditional lunch with local music. A great adrenaline packed day. Steve joined us that night under monsoon rains.. Thankfully those stopped after a couple of days. The next day, as it was raining, we organized a local tour: Hilltribe villages, including the Long Neck People were very interesting. We stopped at Tiger Kingdom to play with baby tigers and pet bigger ones..Big controversy there: are the tigers drugged you think? We think not. But that is us. Maybe people feel they are. Later in the day we visited some temples: Wat Phrathat Doi Suthep, built in 1383 on the top of Doi Suthep mountain was our favorite. We rode around in stinky Tuk-Tuks, which Grant thought was the greatest thing and visited the famous Chiang Mai night market; not a kids favorite at my house, so a really quick visit! Thursday for a 50km bike ride in the south of Chiang Mai's countryside. Very interesting, great food and fun markets discovery with our guide Sun of Chiang Mai Cycling. A fantastic day. Not sure there are many better ways to see an area than on bikes; we try to always take a ride on our trips. But this was really a nice one. 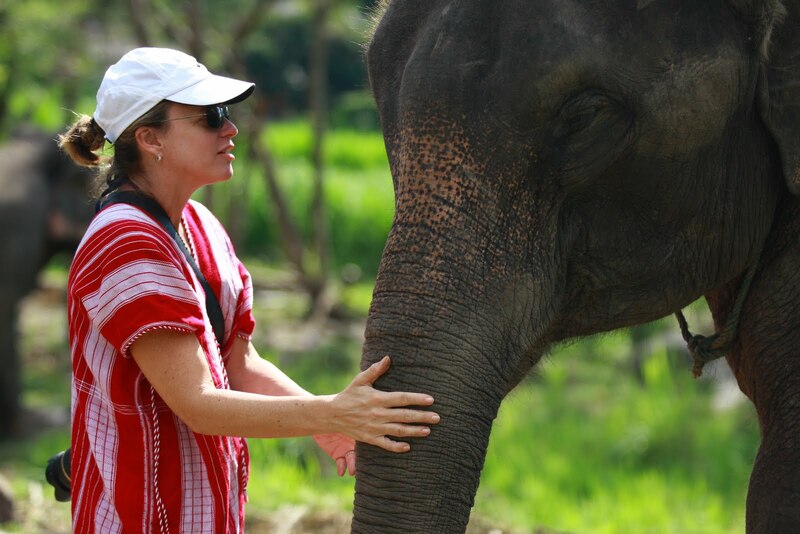 Last day was Elephant trainer for a day at Patara . I think this one will be etched into the kids and my memory forever. From checking poop to climbing on top of the elephants, the day was filled bathing and playing with them, feeding them and walking them through the jungle. 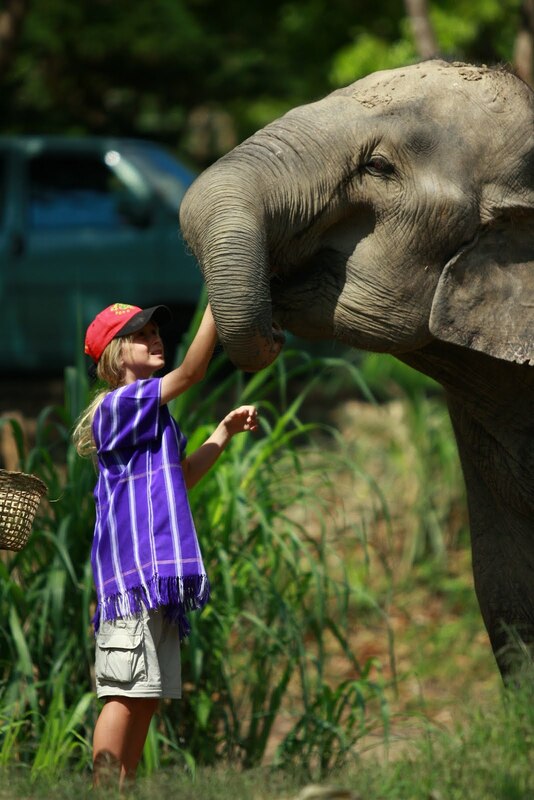 We were each assigned our "own" elephant for the day and had to take care of them from morning to late afternoon. Grant's elephant Colassu was especially endearing, very mischievious and Audrey's Lucky was a nice gentle one. Very nice beginning of the year, we regretfully had to cancel a much anticipated trip to Japan for Easter as we still don't know what is going on there with radiation. So we re-directed towards China's Yunnan province: Lijiang, Tiger Leaping Gorge and Shangri-La for a few days. This is supposed to be one of the most beautiful places in the world on the Tibetan Plateau. A hike through Tiger Leaping Gorge should be the highlight with an overnight stay in a mountain refuge. Very much looking forward to that! The children are much involved in Charitable endeavors at the moment, running a sale of books, gently used toys and cakes, cookies and other treats, to donate the proceeds to "Save the Children of Japan". Everything has given way to the preparations of this weekend's sale: school work, music instruments practice, etc. But what a great idea and initiative. Very proud of them. All in all, life goes on here in Hong Kong, I am excited that my family is planning to come visit in the fall and early next year and am already planning for their visit. Otherwise, school is in its last semester, the kids had great results in the past term and so we are confident now this will be a tremendous experience for them that will have a lasting impact on their life. We are very lucky. Steve's work is doing well, he is happy with the results almost 1 year into it and has exceeded expectations of all at FTI. He is running up and down the local trails and enjoying The Club's facilities, I think mostly the hot tub and steam room! All these hills and steps are giving him a whole different workout, and I think he likes the challenge. Running on the streets of Atlanta will definitely be pretty boring when we get back. He is interested in the majorly difficult training for the Hong Kong famous 100km MacleHose Trail run. This is ran non stop, even overnight, I think the winners come in at around 16 hours. Not sure he will actually do the race, but the training itself should be pretty intense. So a good goal. I will start to work with the American Women Organization - in fact an organization of english speaking women from 33 countries - which organizes activities for its members but also raises a considerable amount of money for local HK Charities, especially those benefiting women and children. I will join them as the new chairperson of the Charitable Donations Committee and member of the Board. My role will be to ensure the funds are distributed to worthy charities through a vetting process and then utilized as described. It will give me an opportunity to get to know a completely different side of HK, outside of the expat circles and life. I very much look forward to it. I continue to train with my crazy Swedish trainer who now has decided to try to kill me on top of a mountain - so there are no witnesses I guess! - with an outdoor "X Training" session every Monday mornings with mountain hiking, TRX, P90X, kick boxing, running and whatever else he can devise to make it as "interesting" as possible. So I challenge you, my Atlanta gym buddies and other friends, to come to HK and join me for a session! Any Monday will do, just let me know! Please keep in touch! All the best for a wonderful and beautiful spring!